A parent and an admissions officer exchange money for a college degree. It is a representation of only one of hundreds of rich parents who have faked their child’s skills, grades and test scores in order to gain easy admittance to a prestigious school. Acceptance rates for universities are getting lower and lower each year while prices increase drastically on an annual basis, and it’s not just a coincidence. As the same handful of schools are increasingly overhyped each year, standards get higher and higher while thousands of applicants are left disappointed. But what is the effect of these challenging changes? Parents who do not believe their children can get into a good college independently provoke an uproar that has caused spots for genuinely hard-working students to be taken away. Lori Loughlin, an actress best known for her role in the hit show “Full House,” poses with her two daughters Olivia Jade and Isabella Rose. Loughlin was only one of several celebrities who are caught up in the “Operation Varsity Blues” scandal. According to the LA Times, celebrity parents Lori Loughlin, Felicity Huffman, Mossimo Giannulli and several others used William Singer’s “admissions assistance company” in order to fake their children’s talent in academics and sports alike. Several other parents with millions of dollars at their disposal have paid to have their kids’ SAT and ACT scores boosted. This highlights the prevalence of privilege and corruption in our society. Children of rich parents are taking up spots that could otherwise be used by students who genuinely want to go to the school and have worked hard throughout middle school and high school careers to get there. As someone who spent eight months, five days a week studying for the SAT, used the entire summer to apply to twelve colleges, applied to over a hundred scholarships and has written dozens upon dozens of essays, this scandal is the embodiment of injustice in a rigged system. Parents’ money is valued over students who have spent hours on end to write the perfect application. This college admissions scandal is a representation of the unfair nature of top universities’ acceptances. Rather than looking for students who are genuinely passionate about the school and have talent and intelligence, UCLA, USC, Yale, Stanford and Georgetown University have allowed their own staff members to prioritize their own greed over the futures of thousands of members of America’s next generation. “‘I don’t really care about school’ [Olivia Jade Giannulli said] in an August video, and missed part of her first week [of school] to travel to Fiji,” according to Vice. It is because of fraudulent parents that unaware youth like Olivia Jade are taking spots from students that could be given for actual high achievement. Vice continues that the scandal “is a lesson in the class system” since admissions officers are allowing parents to commit acts of crime simply because they are rich, leaving middle and lower class families without that advantage. Several students at my school applied to Stanford, and all of them were denied admission. Now my fellow students have to wonder whether they would have been accepted if this unfair and corrupt scandal had not occurred. 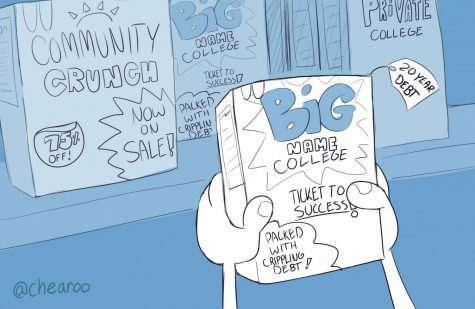 Cereal boxes labeled with “Big Name College” and “Community Crunch” are presented to a shopper. This shows the misconception that if you don’t go to a certain school with the best reputation, you will not be successful. There is a popular misconception that going to an Ivy League or other brand name school is a one-way ticket to success, but that is not the truth of reality. What matters is what you decide to do at the school, the initiatives you take, the work that you do. Students are not guaranteed by any means to be a millionaire just because a certain school is considered “good.” Rather, students should look for whichever school best fits their own personality and desires. It is for this very reason that so many students at “top” schools are unhappy. They made their decision based on the name of the school and not on anything else. It is clear that this college admissions scandal is only one of thousands of illegal acts that are happening behind the scenes. And all because of the misconception that if you don’t go to a certain school with the best reputation, you will not be successful. But your success does not have to be determined by where you go; as long as a student takes the initiative and works hard, I believe they can gain success from whichever college they attend. Students should not let unfair crimes define them; rather, they should go to whichever of the best colleges they are accepted to knowing that they earned their spot. TAKE THE COMMUNITY COLLEGE PILL. ASCEND TO THE NEXT LEVEL OF FINANCIAL INDEPENDENCE. BECOME THE BIG FISH IN THE SMALL POND. I ONLY PAY 600$ A SEMESTER. DO NOT LINE ANOTHER MANS POCKETS WITH YOUR OWN MONEY. LOOK UP THE PRIVATE UNIVERSITY SCANDALS AND ASIAN DISCRIMINATION, ASIANS LITERALLY HAVE TO PAY PEOPLE TO HELP THEM LOOK LESS ASIAN ON THEIR APPLICATIONS. AFFIRMATIVE ACTION EXISTS FOR THE RICH AND THE POOR, BREAK FREE FROM THE BONDS OF SOCIAL TRENDS AND AME DECISIONS THAT ARE RIGHT FOR YOU. ANY MAJOR THAT IS NOT STEM, TRADE, OR A TRADITIONAL SCHOOL OF ACADEMIA IS NOT WORTH PAYING 30K A YEAR. YOU DO NOT NEED A PRIVATE EDUCATION TO BE A SUCCESSFUL PERSON. DO NOT BASE YOUR INTELLIGENT WORTH ON THE ADMISSIONS OF AN INSTITUTION RATHER THE TANGIBLE ACCOMPLISHMENTS YOU HAVE ACHIEVED. Darius, that seems false. Have you been to a college in Cali? it’s like 60% Asian wherever you go. What statistics are you referring to? Im not talking public universities, Im talking private institutions that are also not based in California i.e. Yale, Princeton, Harvard and an assortment of others.